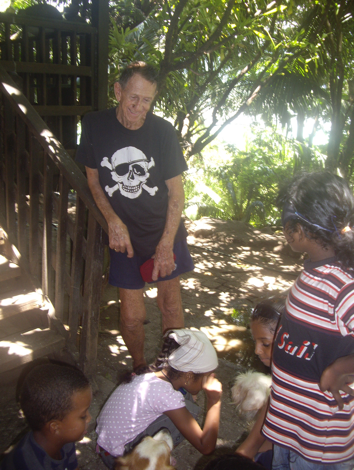 Brendon Grimshaw of Moyenne Island had been a friend for many years to the children of the International School. He encouraged and enjoyed visits from many classes in the school and photographs of ISS visiting the “Pirate island” can be seen in his book ‘ Another Grain of Sand’. Brendon would dress up as a pirate and wave his machete menacingly at the children as they arrived by boat for a “Pirate Adventure”. However, he was in reality a very kind and gentle pirate. He would really get into the mood and hide treasure for us generously burying ‘real money’ as a surprise for the lucky finder. The real treasures were however to be found on Moyenne island where Brendon had planted thousands of endemic trees during the last 50 years. He had lovingly restored the natural habitats for future generations and had great success in breeding giant tortoises in the wild. He was a genuine and generous friend and children all through the school will remember visiting Moyenne island and meeting Pirate Brendon. 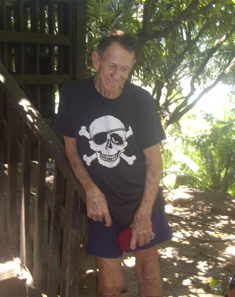 He will be fondly remembered and his legacy will be enjoyed by future visitors to Moyenne island as the Moyenne Island Foundation will continue to care for this unique environment. We hope you like our new look website! We will be keeping you updated using news posts and twitter. As the website develops more downloads will become available so please keep checking back! Our first edition of our new newsletter is out now (link) We need your help with thinking of a creative name for this newsletter. If you have a bright idea then please email our Headteacher daniel.roberts@iss.sc before September and we will announce the winning name in the next newsletter at the start of the Autumn term..